Open Drawings : a list of all drawings that are currently open. Preview : a preview of the selected drawing, layer, block, view, dimension style, table style, XRef, image or material. Use the arrow keys to browse through the items. Editor : to define or edit the properties of Multiline Styles , Multileader Styles , Table Styles , Views , Visual Styles , Sunlight settings , Materials , Render Presets and Section Planes . You can select which panes you want to have open or closed in the View menu. 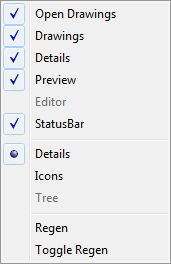 BricsCAD remembers the display settings for each category. Click the Drawing Explorer tool button ( ) on the Standard toolbar. The Drawing Explorer window opens showing the details of the most recently used category. Click the Layer , Linetype , Text Style or Dimension Style field in the Status Bar . The Drawing Explorer window opens showing the details of the clicked definitions category in the current drawing. Choose a Drawing Explorer in the Tools menu, then select a category in the flyout. The Drawing Explorer window opens showing the details of the selected category. Type explorer in the command bar, then press Enter. In the View menu, check/uncheck the sub-window you want to open or close. If you click a settings category in the Drawings sub-window when the Details sub-window is closed, the Details window is re-opened, showing the content of the selected settings category. To close a sub-window, click the close button ( ) in its title bar. To restore the default layout choose Restore Default Explorer Layout in the Settings menu. Launch the Drawing Explorer . In the Drawings > Folders sub-window browse to the folder of the drawing. 3. Double click the drawing. 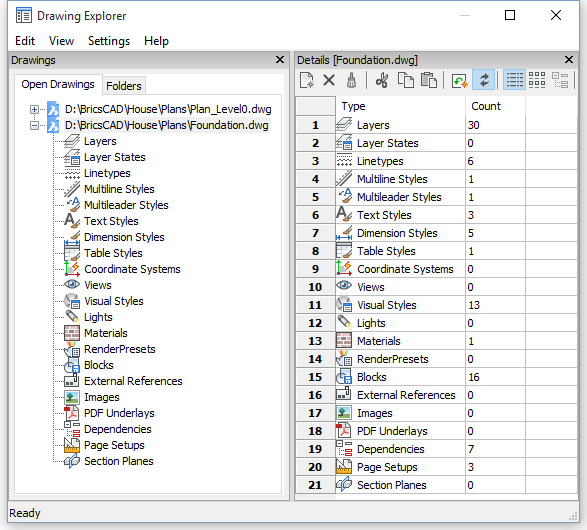 The drawing opens, while the Drawing Explorer window stays open. 4. (optional) Repeat steps 2 and 3 to open more drawings. 5. Close the Drawing Explorer . When you select a drawing, a preview displays in the Preview sub-window. In the Drawings > Folders sub-window of the Drawing Explorer main window click the Add local folder... button. The Browse For Folder window opens. To add an existing folder: select the folder you want to add. To create a new folder: click the Make New folder button. 3. Click the OK button. Drawings in the subfolders of the selected folder can be opened too. The parent folder(s) of the selected folder is (are) greyed out in the drawing folder tree. Drawings in such folders cannot be opened. 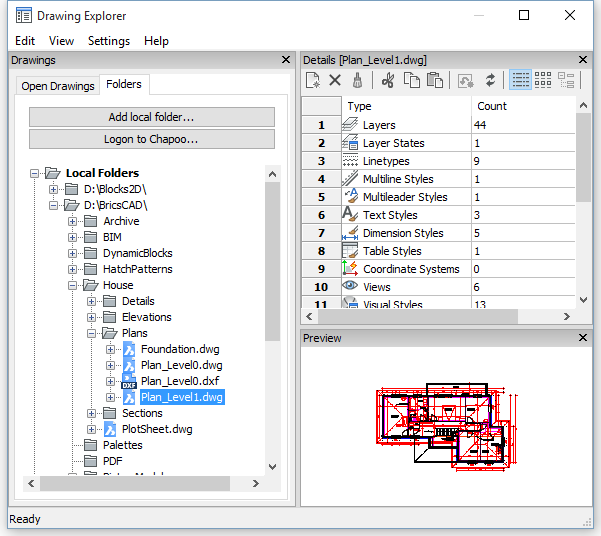 The Block Manager feature of the Drawing Explorer allows to insert blocks in the current drawing from unopened drawings. Open both the source and the target drawing. In the source drawing select the category you want to copy items from, e.g. Blocks . Select the item(s) you want to copy, e.g. a series of blocks. Press and hold the Ctrl key to select multiple items. Press and hold the left mouse button to drag the selection set to the Open Drawings section of the Drawing Explorer . Release the left mouse button when on the target drawing name. The selected items are copied to the target drawing. You will be prompted to overwrite items of the same name. 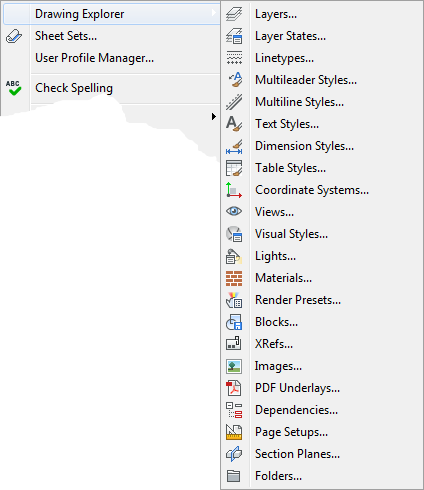 Open the Drawing Explorer > Layers dialog window. Select the layer you want to merge into another layer. Choose Merge to... in the Edit menu. The Merge Layers dialog box displays. Select the layer you want to merge to. The content of the first layer is merged to the second layer. The first layer is purged from the drawing.